According to the latest micro-demographic breakdown, my generation (X) is defined in part by having seen the original Star Wars saga, with breathless enthusiasm, in movie theaters. I'm on the tail end of that group, but I definitely flashed back to my eighth birthday party — an outing to see Return of the Jedi on the biggest screen Duluth, Minnesota had to offer — during the opening crawl for the saga's newest installment, the ominously-titled Last Jedi. 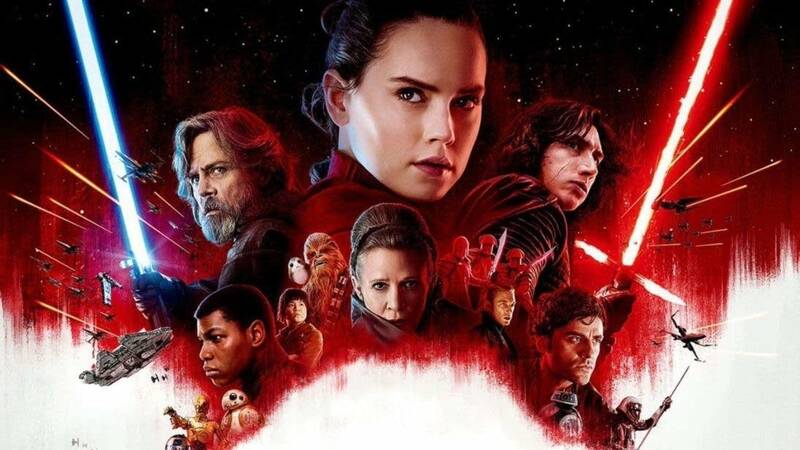 It may be impossible for just about anyone to see a new Star Wars film without reflecting on their generation, whatever that may be, and the post-Lucas Lucasfilm is thoroughly owning the franchise's quasi-religious stature in the sequel trilogy that began with 2015's The Force Awakens. That film turned emotionally on space pirate Han Solo's acknowledgement that the Force is in fact real, and culminated in the discovery of the suddenly secretive Jedi knight Luke Skywalker. With Luke (Mark Hamill) perched high atop a rocky island, his meeting with Rey (Daisy Ridley) could be the setup for a New Yorker cartoon gag — and it kind of is, as we learn in The Last Jedi. We know from previews that he and Rey will develop some kind of master-apprentice relationship, but that Luke nonetheless thinks "it's time for the Jedi to end." Hamill has expressed some frustration with this dark turn in the disposition of his character, who we knew in the original trilogy as a tireless, not to say tiresome, optimist. ("I used to bullseye womp rats in my T-16 back home!") The necessity for Skywalker to grow discouraged and seek seclusion — like Yoda and Obi-Wan before him — was dictated, though, by Lucasfilm's decision to make the sequel trilogy essentially a remix of the original films. Whereas George Lucas told a fundamentally different kind of story in his widely-maligned prequels, with the Old Republic at its peak and rotting from within, it was clear when The Force Awakens involved the return of an evil empire and the climactic destruction of a planet-sized weapon that the operative philosophy of Episodes VII-IX was going to be, if it ain't broke, why fix it? Thus are the heroic rebels still struggling under the oppressive might of the First Order, despite having destroyed three Death Stars, two Sith lords, and the galaxy's most notorious gangster within the span of 40 years. Thus are there, in The Last Jedi, reinventions of The Empire Strikes Back’s battle on ice (you've already seen the new AT-ATs) and the Return of the Jedi throne room confrontation. This new throne room belongs to Snoke, the "supreme leader" who's essentially the Emperor, but CGI and played by Andy Serkis. His character doesn't gain much depth in The Last Jedi, but his throne room is fantastic: minimalist and boxy like something out of the original Star Trek series, except in this case you know it's not a budget issue because the royal roost comes equipped with ninja-like upgrades on the Emperor's red-robed private guards. The Last Jedi was written and directed by Rian Johnson, whose work Lucasfilm loved so much, they've already given him the green light to develop an entire new trilogy with new characters from a long time ago in a galaxy far, far away. A serious Star Wars fan, he's more reverent towards the material than his predecessor (and successor) J.J. Abrams. That comes at a price, as does Johnson's decision to write the script alone and forgo the priceless contributions of Force Awakens co-writer Lawrence Kasdan, but you can see why it felt like the right approach for this installment in particular. The original trilogy found such remarkable success not just because of their quick wit and gripping action, but because they tapped into the universal theme of generational succession. They were about parents and teachers, and about the unanswerable question of whose fault it is when a mentoring relationship goes wrong. That's the theme of The Last Jedi, as we learn more about what was intimated in The Force Awakens regarding the tragedy that caused Luke to lose faith in his order. Kids intuitively understand what it means to be "seduced by the Dark Side": it means getting sick of being told what to do. Another key theme that the new films (including last year's standalone Rogue One) draw sharply is the triumph of collaborative diversity over hateful homogeneity. One of the Dark Side's temptations is the suggestion to surround yourself with people who think and act just like you. That idea was present in the original trilogy — there's a reason Lucas drew on Nazi propaganda films to depict the Galactic Empire — but the new films are purposefully diverse in their casting, to hugely moving effect. The Last Jedi’s standout newcomer is Kelly Marie Tran as Rose Tico, whose plucky resolve recalls the spirit of '77 more meaningfully than all the lingering shots of Luke's vintage lightsaber. The Last Jedi also arrives with the knowledge that it will be the last Star Wars film to star the late Carrie Fisher. Great things were apparently planned for her in Episode IX, but Last Jedi nonetheless makes for a fine swan song. With both Han and Luke out of the picture, we see Leia as the general who stuck around to lead even when it wasn't glamorous. Leia's been a mentor herself, we learn, to an officer played by Laura Dern. The moment in Force Awakens when Rey claims Luke's lightsaber is so powerful in part because that's something Leia never was allowed to do. Although she's Luke's sister, it was the boy who got to play with all the toys. In Last Jedi, Leia has an unexpected and transcendent moment that departs from the Star Wars tone because it simply has to. Very quietly, it reminds us just how much we never knew about the woman who was promised, way back in the Ewok village, that one day she would learn to use her powers. If those Ewoks annoyed you, you'll find plenty to roll your eyes at in The Last Jedi. Chewbacca makes friends with a penguin-like race of critters ("porgs") on Luke's island retreat ("Ahch-To," gesundheit), and the spherical BB-8 gets about three too many cute-droid moments. There's more I won't say because spoilers, but suffice it to say that haters are definitely going to hate. Avoiding spoilers has also meant that I haven't touched on the central plot lines involving the battle of wills between Force neophytes Rey and Kylo Ren (Adam Driver); a dangerous mission undertaken by Rose and Finn (John Boyega); and the hotshot impulsiveness of star pilot Poe Dameron (Oscar Isaac). With 152 minutes of running time, there's more than enough time for all of that in addition to the existential angst and quick giggles. It's an epic experience. Bring a bucket of popcorn, a box of tissues, and maybe one of those bottles that truck drivers use to pee in. Tying everything together is the irreplaceable John Williams, who's been creating the sound of Star Wars since the beginning and draws on his vast library of themes to tug our emotions in the right direction at every harrowing turn — including darker developments of Rey's glistening theme, a bustling casino that has echos of Mos Eisley, and a reprise of the brass-packed "Here they come!" cue from the very first time Luke had to take on a TIE fighter. If there's truly a force binding this cinematic universe together, it belongs to the 85-year-old master composer. Maybe the last Jedi doesn't wield a lightsaber, but a baton. Still, a film is a film, and Johnson — like Abrams and Rogue One director Gareth Edwards — brings a more refined visual sensibility than that of Lucas, whose documentary-influenced approach lent an immediacy that once felt fresh but that the franchise has since outgrown. While nothing in The Last Jedi quite compares with Abrams's snowy lightsaber battle or those X-wings skimming a lake surface, Johnson finds poetry in moments like one in which Hamill stands alone, facing his foes across a vast expanse. A particularly telling image in The Last Jedi has Rey in a hall of mirrors, looking forwards and back as she searches for a resolution to her story. The past is endless, the future is murky. There was no beginning, and there will be no end, as The Last Jedi’s most poignant scenes suggest. From the heroic archetypes that inspired George Lucas to the new heroines lighting the way for a next generation, the star wars rage on. We carry forward what we can, and surrender what we must.